There’s always room for one more social casino game, as proven by the rapidly growing Gold Fish Casino Slots on Facebook. The game has 681,000 monthly active users (MAU), according to our app tracking platform AppData. That’s up from just 206,000 at the end of February. In Gold Fish Casino Slots, players wager virtual currency on underwater-themed slot machines in the hopes of striking it rich, at least digitally. Each machine in Gold Fish Casino Slots can be customized in terms of bet per line, and players can spin the reels with their mouse or space bar. To speed up play, gamers can click on the “stop reels” button to instantly skip to their result, rather than allowing the reels to slow down naturally. Players earn experience points in relation to the money they wager, and will unlock additional slot machines over time. After reaching Level 2, players unlock the Premium Slots feature, which contains multiple limited edition slot machines. These machines are unlocked by filling the Ruby Meter, which is accomplished automatically as players win $50 or more on individual spins. After players run out of money, they’ll need to wait a few hours before the game supplies them with free coins. The game also supports the purchase of coins for players who don’t wish to wait. 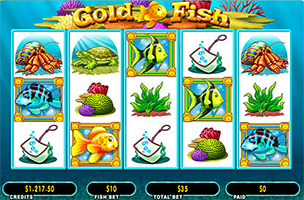 Gold Fish Casino Slots is available to play for free on Facebook. Check back soon to follow the game’s continued growth on AppData.